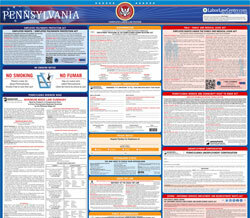 The Public Accommodation Spanish is an equal opportunity law poster by the Pennsylvania Department Of Labor & Industry. This poster is mandatory for some employers, including employers of public accommodation services. This poster, written in Spanish, must be posted in a conspicuous place by any owner, lessee, proprietor or manager of a public accommodation . This poster discusses the rights that consumers have in getting service from the public accommodation, how customers can file a complaint if they feel discriminated against and where to get further information on this issue. It appears you don't have a PDF plugin for this browser. Please see the link below to download pennsylvania-public-accommodations-spanish.pdf.